We’ve discussed the many issues associated with the Tesla Model S car and the danger it poses to consumers before. Sadly, that problem doesn’t appear to be going away: In late February, yet another driver was killed in an accident involving this vehicle when he lost control of the car, hit a tree, and the car burst into flames; later re-igniting and burning several times—possibly due to the car’s lithium-ion battery and its potential to start fires, as has occurred in similar accidents. The victim was a physician and father of five. Surprisingly, this time, the National Transportation Safety Board has decided not to investigate the crash, although it has done so for a number of other crashes involving Tesla cars, including a recent accident in Fort Lauderdale where two people died. According to the agency, this is because it feels that it already has enough to investigate with similar accidents such that it will be able to provide sufficient safety recommendations to prevent future similar accidents. As a result of the agency failing to perform an official investigation, it is still unknown as to whether the driver was using autopilot or the vehicle’s advance driver system. All that is known is that the driver has a clean driving record and is listed as “safe” with a valid license. Still, reports have confirmed that the car’s airbags did not deflate and exterior door handles did not deploy. Also, according to police reports, while being transported away from the site, the car started burning again. Are Lithium-Ion Batteries Safe for Use in Cars? Or Anything Else? While electric cars that use lithium batteries are reportedly usually safe, if the battery is defective or damaged, it can catch fire or explode when it comes to into contact with water or water vapor. Still, these batteries remain the most common type of battery used in electric vehicles. Yet there are alternatives: researchers are currently developing lithium metal batteries, which use a different compound that protects the lithium from coming into contact with water. In addition, electric cars still do not have a lock on lithium-ion fires, and these batteries have caused a number of fires in other devices, such as phones, cameras, and vape pens. Sadly, sometimes the only way to bring change and force companies like Tesla to consider alternatives and ensure that their products are safe is to bring litigation when an accident like this occurs. 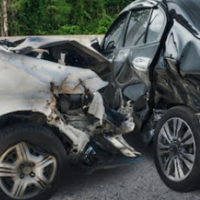 If you have suffered due to an accident like this, contact our experienced Florida car accident attorneys at Douglas & Carter, Attorneys at Law today to find out how we can help.